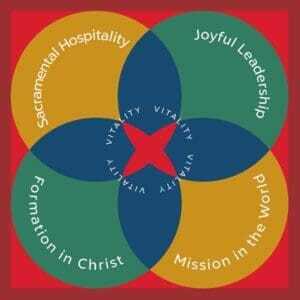 One of the four strategic directions in our Diocesan Mission Plan is Congregational Life. Resourcing congregations that they might become (or remain) vital and healthy is a key component of this strategic direction and is the basis for the work of the Congregational Vitality Task Force. The task force identified four marks that identify vital, sustaining congregations and have added further dimension to what that might mean for different congregations. Sacramental Hospitality: A vital congregation practices sacramental hospitality by directly connecting our worship of Christ as gathered community with serving Christ in the wider world. Mission in the World: A vital congregation is known beyond its own membership as having a particular mission or gift. Church members collaborate with people within the congregation and the wider community through service, crossing traditional boundaries of age, class, race, and language. The congregation intentionally embraces its strengths, engaging strengths and resources in service to Christ, rather than hiding them under a bushel or safeguarding them for congregation members alone. You shall be called the repairer of the breach, the restorer of streets to live in. Individual members can identify a clear or growing sense of mission in their daily lives. Every ministry group exists not for itself but for the wider mission of the church. Ministry groups are periodically evaluated against the wider mission. So if anyone is in Christ, there is a new creation. Click here to download a pdf of The Four Marks of Congregational Vitality.